For regulated service providers in Energy, Telecommunications, Healthcare and Financial industries, selling in a single market, with a single brand, leveraging a single sales channel is relatively easy. The trick is pulling it off across multiple markets, with multiple brands, and multiple sales channels. Having spent over a decade growing and leading outbound sales organizations selling door-to-door, business-to-business, and over the phone, I know what it takes to build high performing sales organizations and I also know how quickly things can wrong. I’ve seen the carnage associated with bad actors, investigations, lost markets, and more. Through all of that, I also learned what it takes to stop that from happening. From all this experience, I've developed the following proven formula for developing scalable and sustainable outbound sales programs. This stands for Process Controls (PC) times Visibility (V) times Customer Voice (CV) = a Scalable and Sustainable Outbound Sales Program (SSOSP). The variables are multiplied because, a weakness or strength in any of these areas will amplify overall failure or success. In other words, you can't afford to have a zero or low value in any category if you want a scalable and sustainable outbound sales program. A lot of regulated service providers are faced by lack of controls over their processes for onboarding new sales agents and enrolling new customers. Not having these controls in place can hurt their brand, hurt their sales and result in fines or expulsion from market, ultimately making life harder than it should be. 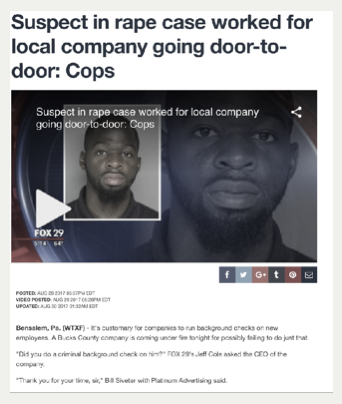 Take for example, the incident in Pennsylvania in 2017 where an energy sales rep was charged with indecent assault at knifepoint. Apparently, the rep already had three previous charges ranging from aggravated assault to criminal trespassing. Because of the incident, the vendor was investigated and got a lot of bad PR, as you can imagine. They even ended up changing their brand name. How does something like this happen? 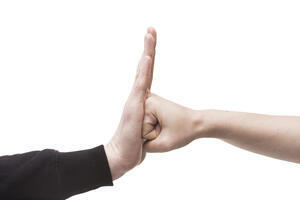 Simply put, through insufficient or ineffective agent onboarding processes and related controls. But agent onboarding is not the only area of exposure. Loosy-goosey customer enrollment controls can be just as bad. For brands to create scalable and sustainable outbound sales programs, they need to digitize their sales agent onboarding and customer enrollment processes. Everyday, commission- based, independent contractors (AKA “sales agents”) show up to offices across the country, get hyped-up, and go out into the field or start dialing away representing a brand, and its products they likely know very little about. What types of customers are they selling? Take it from me. Left unchecked, sales agents are going to work where there’s the lowest hanging fruit in the closest proximity to their home or office, period. But that’s not necessarily where your highest value customers are, right? You see, in outbound sales channels, every contact with a prospective customer represents a new opportunity and a potential risk. Here’s a real example. A supplier recently launched into a new market, they’d made significant investments in their go-to-market plan and recruited a handful of vendors to sell door to door. The vendors subcontracted the deal to a dozen other smaller vendors and teams started hitting the streets. The problem was, sales agents were working the same streets right after one another and after a few weeks, the people in the community had had enough. Due to the high number of complaints and after seeing an actual fist fight break out between sales agents wearing the shirt of the same supplier, the supplier was restricted from marketing door-to-door in three of the five largest counties in the state. Oops. If regulated energy, telco, healthcare, and financial companies who rely on outbound sales teams are going to succeed, they have to be able to see what's happening in the field, on the phone, in retail locations where they solicit. If they don't have robust visibility, they have to get it. Thankfully, there's actually a rather straightforward way to do this - by digitizing their territory planning and sales rep activity tracking. We live in a world where ratings determine who people do business with. People are talking about your brand, whether you’re listening or not. If you’re not listening, they won’t be talking about you much longer. Just doing enough to survive is the definition of complacency, and brands that only gauge customer feedback when a TPV is required by law are forgettable, not scalable or sustainable. Brands that don't listen to their customers’ voice through the entire customer lifecycle, not just at the point of transaction, are missing opportunities to make improvements, get referrals, and up sell. Or they might lose the relationship entirely. In February of 2019, a well-known energy supplier was thrown out of California. They'd spent 5 years developing that market. Their customers weren’t happy and they were the last to know. But it's no big surprise, right? How many relationships last where only one partner is listening? If brands are so short sighted that they are only interested in the transaction, they should be prepared to be replaced when another brand comes along who is more sensitive to their needs. To avoid this, brands should digitize their customers' voice giving them ample opportunity to provide feedback. At Emerios, we work with some of the largest regulated service providers in the nation providing customer enrollment and third-party verification services. You know what we see? The companies most successful at scaling and sustaining their outbound sales programs are paying attention to their sales agent onboarding and customer enrollment controls. They are ensuring 100% visibility into sales agent activity, and they are listening to the customers’ voice always and often. They follow the formula: PC x V x Cv = SSOSP. Those that don’t, can’t seem to succeed across multiple markets, channels or brands. When they do this, they can sell more, and stress less. 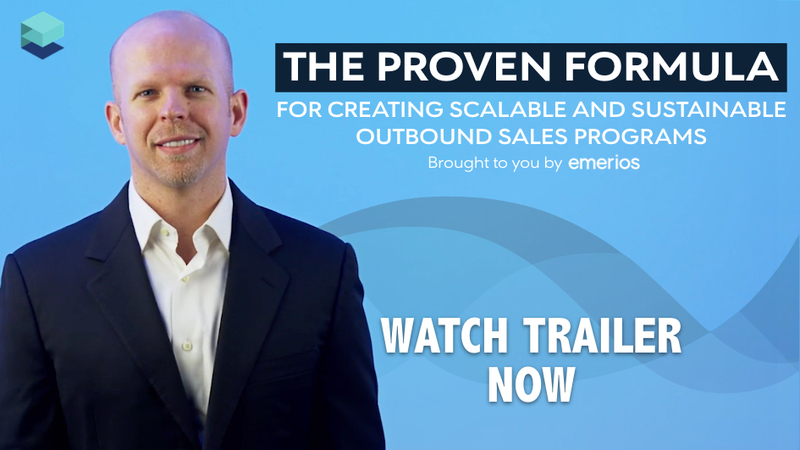 To gain a fuller picture of how you can build scalable and sustainable outbound sales programs, sign up for our free, 3-part video series right now.